Pels occurrence: in the heterochromatin of a host cell nucleus (upper left part); throughout the altered pit membrane (upper right); an area beneath vessel wall secondary thickening; and as traces in altered host wall (lower part). Trembaly et al., Biol. Cell 76: 73-86, 1992. Concerning a culture-grown green alga (Chlamydomonas reinhardtii), submitted to various treatments. In all the figures shown, Pels could be detected in all, having conserved their shapes, despite other noticeable changes in other components. Thus, Pels were observed in dense and elongated bodies in Fig. 2 (treatment with osmium-glutaraldehyde - osmium) with a few in the nucleoplasm including the portions corresponding to the dense chromatin in Fig.1. In this figure (osmium alone), the bodies identified as dense granules also displayed Pels. They are visible in the same type of matter (granules) in Figs. 5 (standard fixation, staining with Bi) and 6 (glutaraldehyde replaced by formaldehyde) and also in elongated bodies in the latter, as in samples subjected to a heat shock before standard fixation (Figs. 10 & 12). In Fig. 12 (labelled for histones, LR White embedding), Pels are visible throughout the heterochromatin, including along the periphery of the nucleus, and the elongated body (mentioned here as possibly having an interaction with chromatin). In the subsequent figures., probes for DNA (gold complex monoclonal antibody) and for RNA (gold complex RNase) have attached to bodies displaying the elements in question, including samples subjected to a pronase treatment before labelling, and embeded with Lowicryl K4M. Bendayan, J. Elec. Microsc. Tech. 1: 349-372, 1984. Pels in heterochromatin in Figs. 4 &17, for example. In the latter, stained with tannic acid after fixation, the structures lining the basal layer appear to be generally slightly larger than those visible as part of the heterochromatin, or are both the same?. Ouellette, Can. J. Bot. 58: 1056-1073, 1980. Occurrence in Figs. 23 23C, in opaque material present in initial tylosis wall and deposits therein; similarly in opaque material included between tylosis and vessel wall and in wall apposition in the adjoining parenchyma cell in Figs. 30 & 30A. Mims et al., Can. J. Bot. 79: 49-57, 2001. Study material fixed by high pressure freezing. Pels in nucleus in Fig. 5; in tubular elements in Figs. 10-12; in the opaque mass of matter at tip of label Pm in Fig. 13; in opaque matter (attributed to wall ingrowths) surrounding the hyphae in Figs. 15-17. Mims & Richardson, Can. J. Bot. 83: 451-458, 2005. Pels in heterochromatin in Fig. 20. Ouellette et al., Microsc. Microanal. 10: 449-461, 2004. Pels’ occurrence, in material surrounding fungal (F-) cells in Fig. 3g, as already mentioned, and in extracellular material of F-cell in Fig.3f. Charest et al., Mycol. Prog. 3: 137-150, 2004. Occurrence in material surrounding F-cells in Fig. 4. Ouellette et al., Can. J. Bot. 77: 644-663, 1999. Occurrence in material bordering F-cells in Fig. 5, in the vessel wall lining matter in Fig. 6, and that in Fig. 8. Ouellette et al., Can. J. Microbiol. 45: 582-597, 1999. Occurrence in material surrounding F-cells in Figs. 6-8, and in Figs. 32 & 33, amongst others. Bauer et al., Can. J. Bot. 75: 1273-1314, 1997. Pels distinguishable in several illustrations as: in F-wall in continuity with extracellular matter in Fig. 24; in some of the intercalary opaque matter in Fig. 33; in less opaqueEM in Figs. 34, 36, 37, 49; in opaque matter in Fig. 57; and in interaction apparatus (fixation by freeze substitution) in Figs. 56, 65. Nicole et al., Eur. J. For. Pathol. 22: 266-277, 1992. Occurrence in opaque material in Figs. 5 & 7, included in altered portion of host cell walls, but its absence in adjoining intact wall. Also in Fig. 9. Benhamou et al., Can. J. Microbiol. 36: 149-158, 1990. Occurrence in the “dome” of opaque mater in Figs. 10, 11, and seemingly also in Figs. 2 & 5, and in the largest protuberance on the F-cell at the left in Fig. 1. For this reason, the naming of this layer as if it corresponded to the outer cell wall may need to be revaluated. Compare with figures in Hickey and Coffey, referred to below. Ross & Sumner, Can. J. Bot. 83: 459-466, 2005. Pels in heterochromatin in Fig. 6. Mims & Richardson, Can. J. Bot. 85: 935-940, 2007. Pels in nuclei in Figs. 10 & 11. Mims & Richardson, Can. J. Bot. 85: 175-183, 2007. Pels in matter identified as interaction zone in Fig. 31. Mims et al., Can. J. Bot. 85: 926-934, 2007. Pels in nuclei in Figs. 20 & 22. Mims et al., Can. J. Bot. 84: 1186-1195, 2006, Pels in host walls (left cell portion) and in opaque matter next to F-cell (close to upper arrowheads). Also in the opaque mass (N?) in the upper cell adjoining the hyphae. Garrison et al., Mykosen 26: 462-468, 1983. Occurrence in material surrounding F-cells in Fig. 3. Chamberland & Lafontaine, Histochem. J. 24: 1-8, 1992. Occurrence in heterochromatin in Fig. 4. Chamberland & Lafontaine, Chromosoma 102: 220-226, 1993. Occurrence in heterochromatin in Fig. 6. Nicole et al., Eur. J. For. Pathol. 21, 1991. Occurrence in Figs. 3-7, in Fig. 5 in the middle lamella. Tenberge et al., Phytopathology 86: 1084-1091, 1996. Occurrence in association with material labelled for polygalacturonases in Figs. 8A,8C , and 10D, and similarly in Fig. 8D; in or along the opaque labelled material in host walls (part left of label oew); and in the F-cell. Cole et al., New Phytol. 136: 611-622, 1998. Pels in fm surrounding the F-cell in Fig. 22. Hickey & Coffey, Can. J. Bot. 55; 2845-2858, 1977. Occurrence in EX in Figs. 12 & 13, and at its juncture with host walls in Figs. 6 & 7, as in the eroded hw portion adjoining the mass of opaque matter (PX) in Fig. 3. These authors have mentioned as probable that this opaque matter could be of pathogen origin. The formation of denticulate projections of this matter around haustoria (see also paper in Physiol. Plant Pathol. 77: 199-204, 1980) can better be explained as emerging from the subtending layer than as being host cell deposits selectively attracted to targeted sites on the F-cell wall. Siefers & Ammon, Phytopathology 70: 1050-1055, 1980. Although one might argue about the imperfect tissue preservation here, the occurrence of structures similar to Pels can be detected in some of the opaque matter surrounding the pathogen cells and/or in the host primary wall below in Figs. 3A, 3B, and 4B. These structures are particularly evident in Fig. 4B, associated with opaque matter extending from the penetration peg into the host wall. Gilloteaux et al. , Microsc. Microanal., 9: 311-329, 2003. From vitamin treated human ovarian carcinoma cells, in vitro tests. Pels-like occurrence: in nucleus and mitochondria in Fig. 1;, in heterochromatin and nucleolus margin in Fig. 3D; also in nuclei in Figs. 5B, 5E, and6C , some in cytoplasm and keratin-rich filaments in Fig. 5E; and in excided cytoplasm in Fig. 5D. Alterations related to vitamin additions and enhanced by sham-treatments. Dias et al., Microsc. Microanal. 10: 215-223, 2004. Concerning Paracoccidiodes brasiliensis, causing a systemic human mycosis in Latin America. Pels-like in Figs. 5A & 5C and in material next to P-cells and in the neutrophil (N) in its lighter areas. Petry, Microsc. Microanal. 10: 586-60, 2004. Concerning Cryptosporidium parvum. Pels-like in the nucleolus in Figs. 9a & 9b. Hemphill et al., Micraosc. Microanal. 10: 602-620, 2004. Concerning Neospora caninum, in vitro studies. Pels-like in the organelle labelled nuc and in the cytoplasm in Fig. 1G, and in nuc in Fig. 7B, amongst others. Field et al., Microsc. Microanal. 10: 621-636, 2004. Concerning Trypanosoma brucei, in vitro studies. Pels-like in nucleus in Fig. 1, and in the nucleolus in Fig. 7. Sant’Anna et al., Microsc. Microanal. 10: 637-646, 2004. Concerning Trypanosoma cruzi, in vitro studies. Pels-like: in nuclei and kinetoplast, Figs. 3a, & 3b; similarly in Figs. 4a-4c; and in the nucleus in Figs. 5a & 5c; and in flagellar pockets in Figs. 5a-5c. Miranda et al., Microsc. Microanal. 10: 647-655, 2004. Concerning Phytomonas françai, a trypanosomatid plant pathogen, in vitro studies. Pels-like: in layers delimiting electron-dense organelles, in Figs. 3F & 3G; and in the organelle itself in Fig. 3G. These organelles in Fig. 3A, some appearing as budding or interconnected by a fine filament, recall the bodies observed in host and F-cells in illustrations regarding Tilia, article VI in this Web site. Benchinol, Microsc. Microanal.10: 528-550, 2004. Concerning Trichomonads. Pels-like in the nucleus and nucleolus in Fig. 6e and in microtubule-organizing center (MTOC) in Fig. 13, which are smaller than cross sections of tubules, particularly at point of juncture with the nucleus (left part) and in the material at the right. Scales & Peterson, Can. J. Bot. 69: 2135-2148, 1991. Pels in hn (at the left) in Fig. 34. In Fig. 41, elements present at the tip of the F-cell are mentioned as occurring in a glancing section of the cell, but smaller elements (Pels ?) are visible in the surrounding material below. Ouellette et al., Phytoprotection, 81: 69-86, 200. Occurrence in Figs. 19 & 20, in opaque matter extending from the F-cell into and across host wall. Pels occurrence: along the margins of wall secondary thickenings (bottom part of figure. These normally would correspond to protoxylem V-elements); in the membranes of the pit fields, if they were so; and in the more lucent but pervaded wall layer below as in the adjoining opaque matter. Note: the type of breakdown of the V-walls, as described in article V in this site. Chamberland et al., Can. J. Bot. 69: 1265-1274. Occurrence in intercellular space in Fig. 5 and in material extending from the F-cell in Fig. 9, as at the tip of the M-cell in Fig. 8. Nicole et al., Appl. Environ. Microbiol. 59: 2578-2588, 1993. Occurrence alongside H- cell in Fig. 1C. Chabal et al., Can. J. Bot.69: 2044-2054, 1991. Occurrence in a rust fungus grown on a polycarbonate membrane. Structures in question are visible in the mass near label E and along the F-wall, including the portion encroaching on the membrane, in Fig. 10. Bago et al., Protoplasma, 192: 80-92, 1996. Occurrence in Fig. 4f, in the nucleus and similar material connected to it and to that present in the nucleus in Fig. 5b. Howard & Aist, J. Cell Biol. 87: 55-64, 1980. From fungi grown on cellulose membrane and treated, before fixation by freeze substitution methods, with other compounds, including: DMSO, deuterium oxide (D2O), and methyl enzimidazole-2-ylcarbamate (MBC). Figures under consideration are present in the heterochromatin in Fig. 9, and in portions of mitochondria, some of those possibly corresponding to cross sections of cisternae, but others being smaller than these (Figs. 1, and 3-6, MBC and D2O omitted, respectively). Bishop & Cooper, Physiol. Plant Pathol. 23: 323-343, 1983. Pels are distinguishable in the vessel wall along the material pervading it and the wall lining material connect with it, in Figs. 5c, 5d. The occurrence of similar structures is suspected in the pit membranes as in the opaque matter overlaying them and in the confluent lining in Figs. 9a, 9b. Griffiths, Can. J. Microbiol. 17: 79-81, 1970. From Verticillium dahliae grown on cellophane membrane and fixed by standard chemical methods. Figures under consideration are visible in the membrane along the hypha penetrating it, for example in Figs. 2-4, in association with traces of opaque matter. Mutto et al., Phytopath. Z., 91: 39-51, 1978. Occurrence in opaque matter next to F-cells and in adjoining middle lamellae and contiguous host wall portions in Figs. 7 & 9 as also in Figs. 10-13, in Fig. 13, in association with material reaching from the cell content across the F-wall. In these figures, however, a few white dots are noticeable, which appear not to be included in the section. Landes & Hoffmann, Phytopath. Z., 95: 259-273, 1979. Occurrence in opaque material bordering HP and in the cell perilasmic area as well as in the cuticle in Figs. 9 &10. 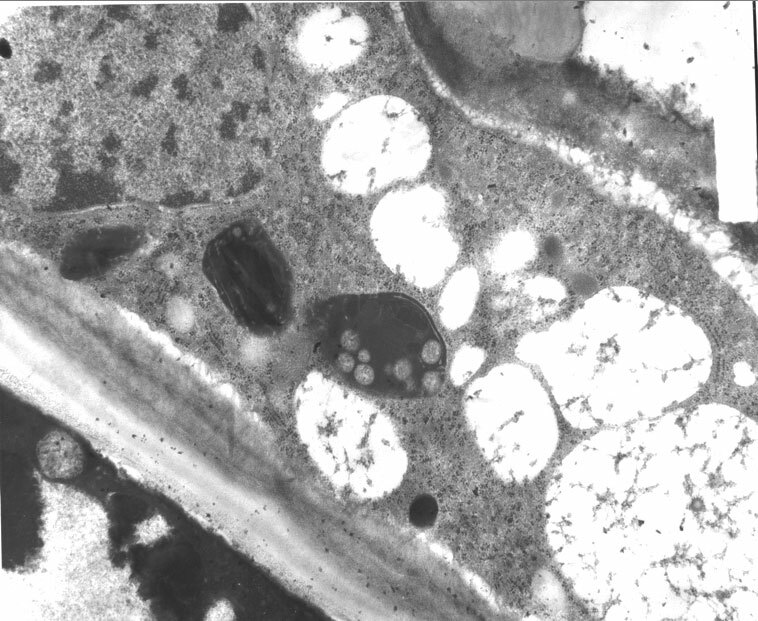 Some are also visible in host cell wall below the label PK in the last figure, as are others in the wall portion at the right in Fig. 7, in association with traces of similar opaque matter reaching to the PH wall, but are obscured here by stain deposits. Holt and Beveridge, Can. J. Microbiol. 28: 1-53, 1982. Elements under consideration are distinguishable in the bacterial cells shown in Figs. 92 – 94, in Fig. 94, in relation with areas labelled for DNA. Benyagoub et al., Mycol. Res. 100: 79-86, 1996. Possible occurrence at the tip of the F-cell in Fig. 9 and at the extremity of cell M in Fig. 8.
in host wall in Fig. 6; and in the opaque matter near letter P in Fig. 11. The distended host wall here does not display similar structures but these are present in the more compact wall layer. O’Connell et al., Physiol. Mol. Plant Pathol. 28: 99-105, 1986. Occurrence as traces in midlle lamella and adjacent host wall below F-cell in Fig. 2. O’Connell et al., Mol. Plant Microbe Interact. 3: 33-40, 1990. Occurrence in the host wall invaded by opaque matter and in the material surrounding the infection hypha, including the first wall apposition, the contiguous opaque material and then the lighter layer with traces extending into the more lucent host wall deposit. Traces of similar elements can also be distinguished in the opaque content of the small hypha. Hutchison et al., Mycol. Res. 106: 729-736, 2002. Occurrence in Fig. 12, in the host wall and in parts of the opaque matter between it and the F-cell. C- Suspected occurrence (SO) of these Pels, despite poor illustrations in some instances. Pels occurrence: in altered part of pit membrane (next to wall secondary thickening, upper part of figure) and in wall layers between and around the small occluded V-elements below; in the more lucent matter in these; in the adjoining intercellular spaces; and in the host cell nucleus heterochromatin (below). 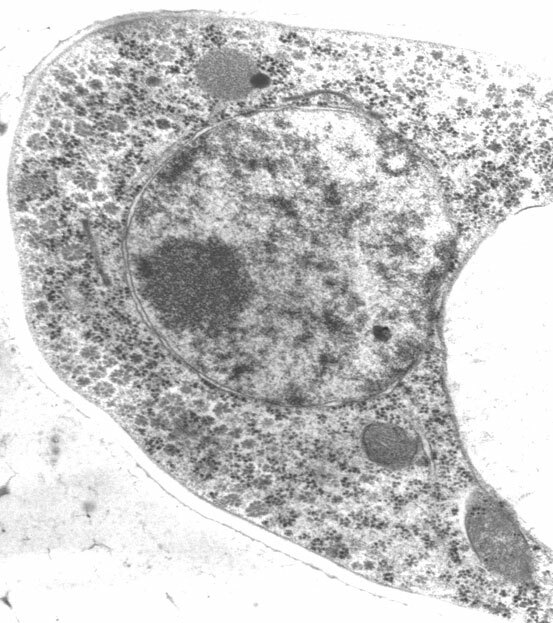 A few Pels are distinguishable in the opaque material in the outer cytoplasm of this cell. 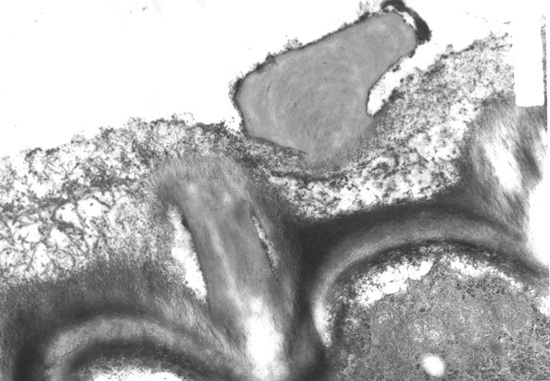 Profiles of Pels can be distinguished in the other intercellular areas between these cells, including that adjoining the cell containing an extra secondary wall layer, but are not detectable elsewhere. N.B. The three illustrations shown above are from elm samples taken shortly after inoculation, and from twigs. Newcombe & Robb, Physiol mol. Plant Pathol. 34: 55-73, 1989. Pels-like in heterochromatin in Fig.4, and opaque matter surrounding F-cells in Fig. 5. Benhamou et al., Plant Physiol. 92: 995-1003, 1990. SO at the tip of F-cell and adjacent more lucent matter in Fig. 10. Lazarovits & Higgins, Can. J. Bot. 54: 235-249, 1976. SO: in opaque matter next to lower F-cell: in host cell wall pervaded by similar matter and in the cell periplasm; and similarly, in that surrounding the F-cell in Fig. 13, showing connections of such mater with content of the cell across its walls at sites, and in the intercellular space above. Pegg, Physiol. Plant Pathol. 8: 221-224, 1976. SO in F-cell walls and sheaths in Figs. 6 & 7, particularly in portions where the opaque matter spreads across these layers to the cell content. Robb et al., Can J. Bot. 53: 2725-2739, 1975. SO: in material surrounding and bridging F-cells in Fig. 12; in that surrounding F-cells in Fig. 14; and in the bands of similar matter indicated by arrows above. Ibid, pp. 901-913. SO in the material similarly surrounding F-cells in Fig. 8 and in the band of similar matter associated with host wall alteration in Fig. 7, as in some contouring the F-cell, in which opaque matter pervading its wall and reaching the cell content. Ibid, 56: 2594-2612, 1978. SO in intercellular spaces in Fig. 23 & 24, as in the bands of matter in Fig. 24 bridging the F-cell to the layer identified as coating. Ibid, 57: 822-834, 1979. SO in the material at the lower end of the SW thickening and in the layer surrounding it in Fig. 14. (comment: is that really a tylosis wall? ), and in the band of opaque material extending above label 22 in that Fig. Also, in Fig. 31, in pit membranes, particularly the upper one and in the material extending at the base of the secondary thickening. A number of publications were also consulted in which the Pels -like occurrence was suspected in material associated with F-cells, but which were not shown at high enough magnifications, or where the samples were subjected to particular treatments which enhanced the opacity of that matter, thes, being often interpreted as deposits. The following examples are provided to illustrate this point. Duddridge & Sargent, Physiol. Plant Pathol. 12: 289-296, 1978. Profiles of Pels can be distinguished in the host cell wall in Figs. 13 & 14, next to opaque matter ranging, in Fig. 14, from inside the F-cell to inside the host wall. It is to be noted here that these were not subjected to lipid or lipase tests. Yet, the occurrence of similar profiles can be suspected in the opaque material having links with F-cells in treated samples as well (Figs. 18 & 21), this material here being mentioned as deposits. Murray & Maxwell, Can. J. Bot. 53: 2872-2882, 1975. Similar situation as that mentioned above, concerning Figs. 7 & 8, where such profiles can be suspected to occur in the lighter portions of the material in host walls, and in that surrounding the F-cell in Fig. 7. After a close examination of all the papers listed above, at least two main conslusions may be hinted to: 1) configurations of the “P-elements” can be distinguished in all these papers, independently of the systems they represent and of the treatments concerned, including various methods of fixation, including high-pressure freezing. The occurrence of such structures in O. novo-ulmi grown on an agar medium and fixed by this method is shown below, restricted to its nucleus heterochromatin. Also, similar structures can be distinguished (in some similarly fixed material of this fungus grown on pre-sterilized wood sections) in the more greatly magnified illustrations in Ouellette et al. (Can. J. Microbiol. 41: 1095-1110, 1995, in Figs. 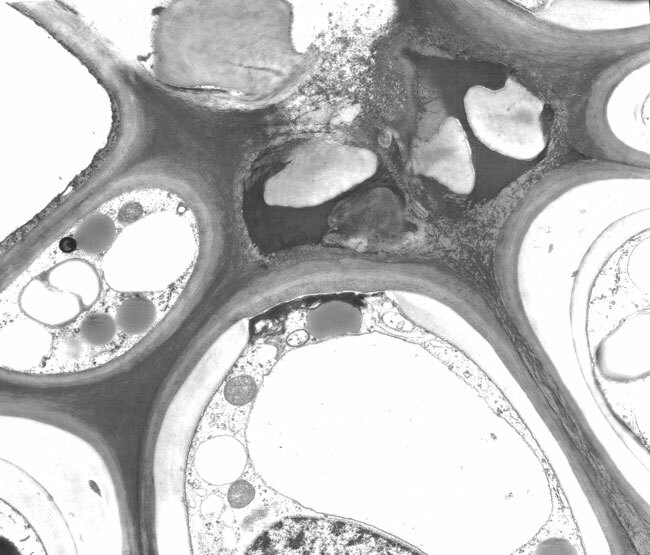 27 & 29 in the host cell walls next to fungal cells, and in Fig. 28, in the central area corresponding to the nucleus. Similar structures can likewise be detected in the well delimited area in Fig. 23, present in an otherwise irregular form); and 2) structures of similar and regular sizes were thus observed in pre-sterilized, inert or natural substrates, indicating that no reactions from a living host could be involved in these cases, supporting the notion that even in living hosts the structures at stake did not simply issued from a host cell reaction.